This Alex traditional black aluminium upward outdoor wall lantern is rated IP44, looks stunning and illuminates your outdoor areas perfectly. Featuring a cast iron effect finish, stepped wall mount and arm, upward facing hexagonal lantern, clear lantern panels and top finial. Perfect for outside illumination so you can add a touch of elegance next to your front door, pathways or garden area. It is IP44 rated and fully splashproof to protect against the elements. Alchromated for extra durability, with a three-year finish guarantee. Please follow this link to download or view the installation instructions. 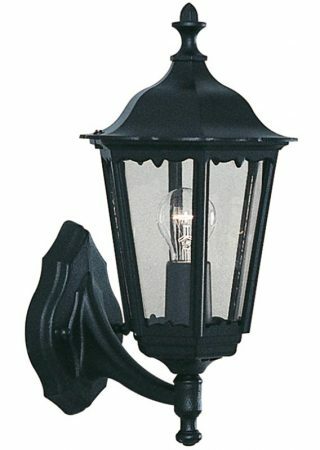 Supplied by Searchlight who manufacture some of the best traditional and modern classic designs such as the Alex traditional black aluminium upward outdoor wall lantern you see here.